Classic flavors and smooth experiences is how you’d classify American Club Pipe Tobacco product offerings. The no-frills pipe tobacco is light and refreshing, while also being very flavorful. 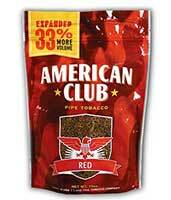 American Club Pipe Tobacco features a base of both Kentucky and Virginia tobacco blends that you’ll crave! Warm and rich, American Club Pipe Tobacco is perfect for a no-joke smoking experience that will leave a smooth finish with each and every smoke. 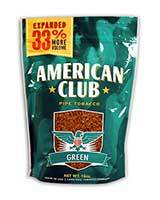 American Club Pipe Tobacco comes in three distinct flavors: Classic, Light and Menthol. Classic is pure and robust in flavor. You can enjoy the non-aromatic blend any time of the day when you crave a smoke. 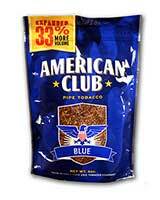 American Club Pipe Tobacco Light is smoother than classic, but still very enjoyable. The Menthol American Club Pipe Tobacco blend is infused with aromatic menthol flavoring. You’ll love its refreshing and cool smoke experience that offers no bite at the end. It’s a great light and smooth alternative to the Classic offering. Many seasoned smokers love the economy-priced domestic tobacco American Club Pipe Tobacco offers, allowing them to enjoy it all day long. 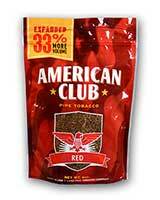 Satisfaction with every smoke is guaranteed with all of American Club Pipe Tobacco flavors.